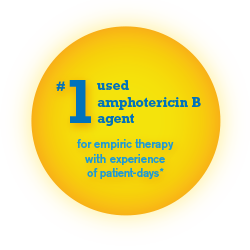 Based on results from a randomized, double-blind, multicenter study of 244 febrile neutropenic patients who previously received broad-spectrum antibacterial therapy, receiving either AmBisome 3 mg/kg/day (n=85) or 5 mg/kg/day (n=81), or Abelcet 5 mg/kg/day (n=78). The primary endpoint was safety and the study was not designed to draw statistically meaningful conclusions related to efficacy. Abelcet is not labeled for this indication.